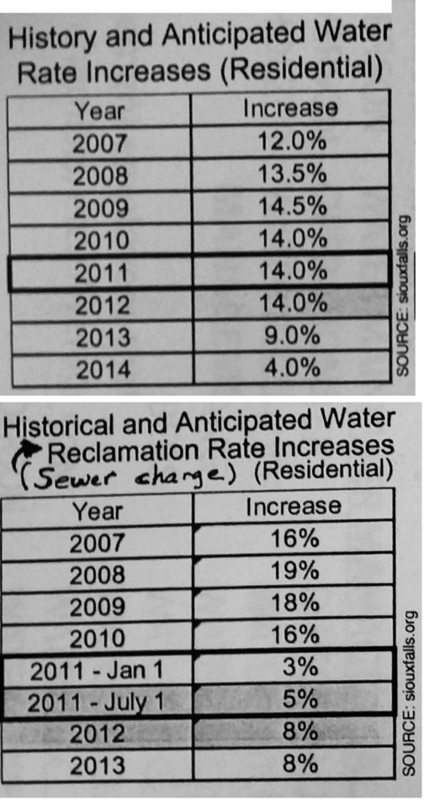 ← UPDATE III: Should new Sewer Plant bonds be paid for through user fees? I guess you and I are not “media” as we were promised to be considered. Does mean we are going to re-experience the abuses of ‘ol bowlcut and buckteeth? I am going to go out on a limb here. I think what she said, and what she meant could very well be two different things. I have not seen the video so I cannot jugde by that alone. Maybe what she meant is rates have gone up 300%, not gone to $300. Would be easy to do with the bright lights shining. Protect the homeowner/citizen with backup from the Second Penny Tax!!! I am thinking that is what Ms Stehly is proposing as protection for the homeowner, in case The city’s projected growth is not attained. This water treatment facility is the largest ever proposed expenditure ($260M) on record for SF residents. Event Center was around $120 M. I believe we would owe about a $25M yearly payment on the debt. And currently we have 55,000 homes. Do the math for your share of the payment. What is concerning is why the city is not proposing usage of the 2nd Penny Tax when they have previously used it for so many unneeded projects. What gives??? It was a sarcastic figure of speech, sarcasm is used to present the absurdity in the truth. It is absurd to think we can pay down this debt with just user fees. I think that is the point she was trying to make. She was asking basically if the projected growth doesn’t happen will our water rates have to be raised to $300 to pay off the debt? KSFY came to the rescue of Paramedics Plus, too, do you remember? Too bad KSFY doesn’t present news all day long, because then our Mayor could just sit back and watch them and get ideas like the ‘Clockwork Orange’ mess does from FOX….. This is a fine example of how your stretching the truth and over exaggerations has consequences. My advice Theresa would be to pay less attention to Scott and apologize for the incorrect choice of words. 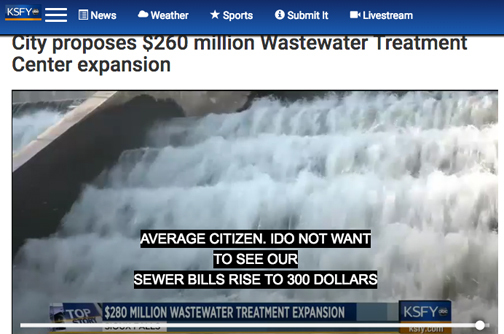 You did not intend to insinuate the average user would see a $300 water bill. Yeah, make sure that new facility can clean the fire dept’s foam out of the drinking water. It’s not the mayor’s place to call out a councilor. Nor should the media misrepresent statements. 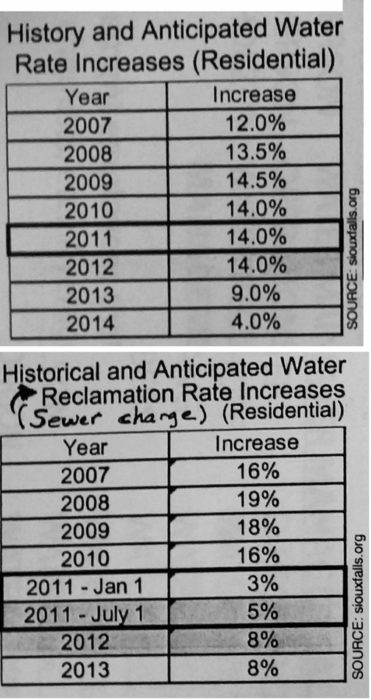 From the chart water rates are aligned with inflation and growth. Good infrastructure (i.e. water) is relevant for public health and real estate valuation. An investment such as this relates to quality of life. Now is a good time for this. Later will be more costly because of rampant growth and lack of sophisticated planning. Besides, a good political scuffle is free entertainment and more fun than expensive concerts at the Denty. The long term financial impact on citizens seems to be more concerning to people on fixed/limited incomes who need this as a basic necessity. I want to ensure that we are not faced with monster rate increases when the debt payment really starts to ramps up. Let’s look at all funding options. Good people don’t expect our elected officials to be perfect. We do expect those people to own their mistakes and admit when they’ve misspoke. When has Trump ever apologized for his thousands of sarcastic remarks and exagerations? Last I checked, he is a little higher on the totem pole than Stehly. Besides, in this case she used sarcasm in an appropriate manner, and it certainly wasn’t inflamatory or directed at any one person. She never said your bills WILL rise to $300 but they could. As I said in the original post, I did cringe a bit when she said it, but as long as she owns and sticks by it, it’s her deal to deal with. Ironically she may not be that far off the mark when you consider we have had well over a 100% increase over the past 10 years. I can’t think of any other utility that could get a way with that. Trump gets a “B,” while Stehly gets a letter of reprehend. Trump gets no love from me and I’ve typed that out several times right here. I expect very little from our president in civility of doing the right thing. I would hope our local folks would use him as an example of how NOT to be. Still time to do the right thing here. Have a private meeting with the mayor and come together to set the correct tone. Civil disagreement is ok. Word fights through the press is not.